We don’t sow many seeds in March because we’ve found the low levels of light at this time of year tend to cause the plants to become etiolated very quickly. This is what we’ve chosen to sow in March. Peas – Champion of England seeds from The Real Seed Catalogue. 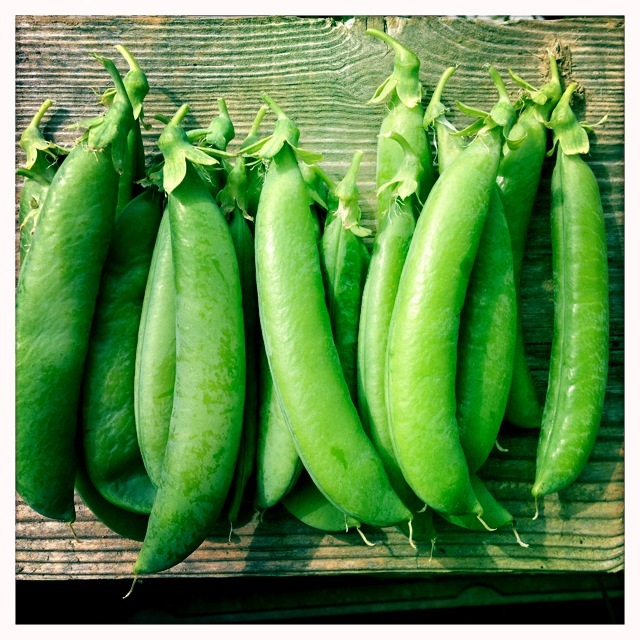 We grew this variety of pea last year and the peas were fabulous but the cropping season was over rather quickly. This year we shall extend the cropping season by making sequential sowings of peas. I’m planning to sow seeds every month until June…… I’m also thinking of investing in a new chest freezer…. I’m ever the optimist! I’ve sowed the seeds individually in deep root trainers and I’ve placed them outside in a propagator. They are in individual modules because pea plants don’t like root disturbance and we’ve found these root trainers work quite well. The idea behind placing them outside is to try to prevent the young plants from becoming etiolated. I’ve not tried this before so lets see if it works or not. These seeds conveniently came with a gardening magazine at the very time we were considering growing celeriac… it was a sign! This is my experimental vegetable of the year! We’ve not grown it before but we both enjoy eating this rather odd looking vegetable. The seeds are tiny and they need light to germinate. I have scattered the seeds sparingly on moist compost. I have covered the module with cling film to aid germination, a top tip from my gardening genius friend Tony. They have also been placed in a propagator and left inside on a south facing windowsill. The seeds take between 2 to 3 weeks to germinate. Rather slow for my liking but I’m assuming this is why the process is started in March. Another experimental vegetable, we’re not grown broccoli before either. We’ve chosen this variety because it doesn’t need vernalisation (winter chill) to produce the purple spears. This variety is also fairly heat tolerant. Sow the seeds from March until June at intervals to ensure a long cropping season. 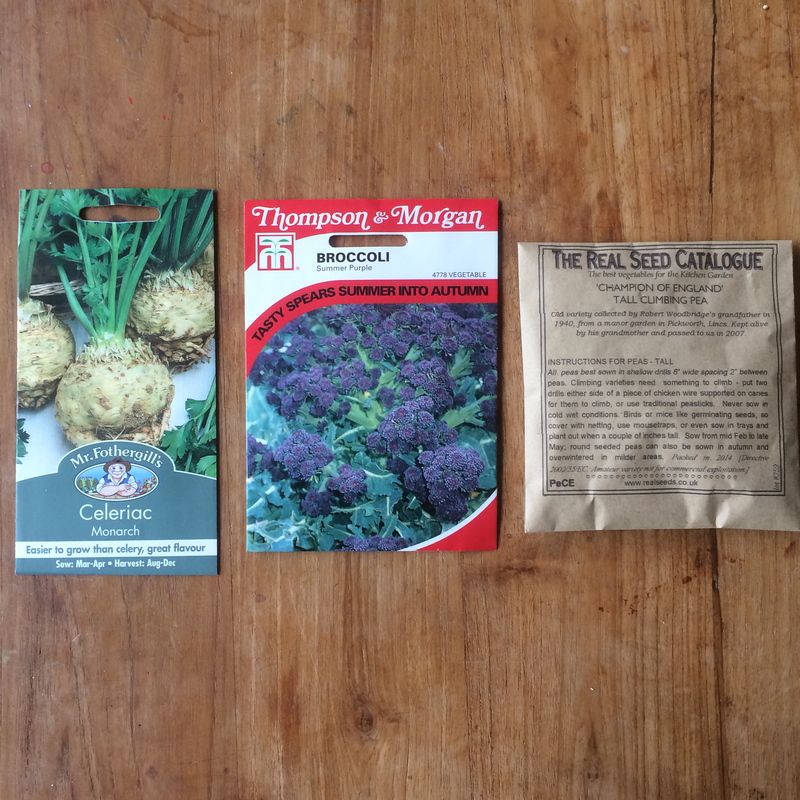 I plan to sow some seeds towards the end of March and then every six weeks until June. We should be able to harvest the broccoli from July until November. Over the past couple of weeks the weather has been gloriously sunny and fairly warm for this time of year, it hasn’t felt like winter at all. 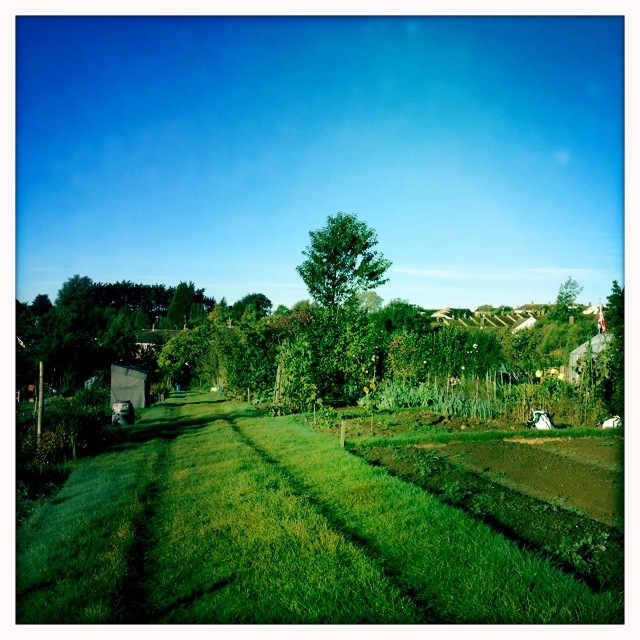 Enticed by the sunshine we returned to the allotment last week after a rather long spell away. We were pleasantly surprised by what we found. We grow a few crops over the winter months, garlic, leeks, kale, parsnips and phacelia (a green manure) in the empty beds. The garlic that we planted at the beginning of November has shown an excellent rate of germination and has grown into healthy small plants. Garlic planted 4 months ago. The leeks overwintered well but they’re not quite as good as last years crop; they’re quite small this year. 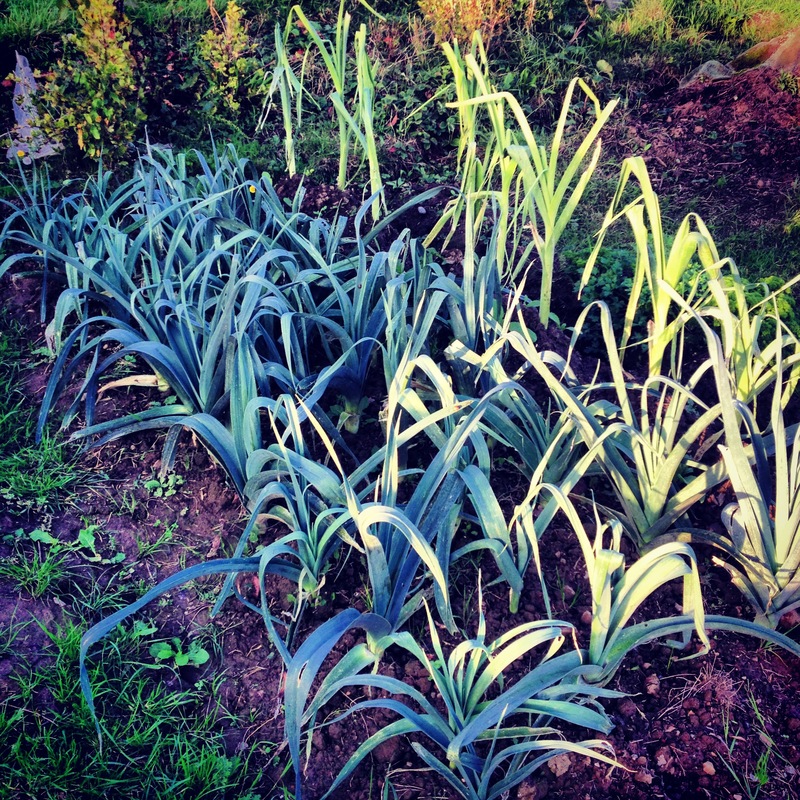 We’ll need to harvest the remaining leeks before the plants start to produce a flower stem, usually around May. 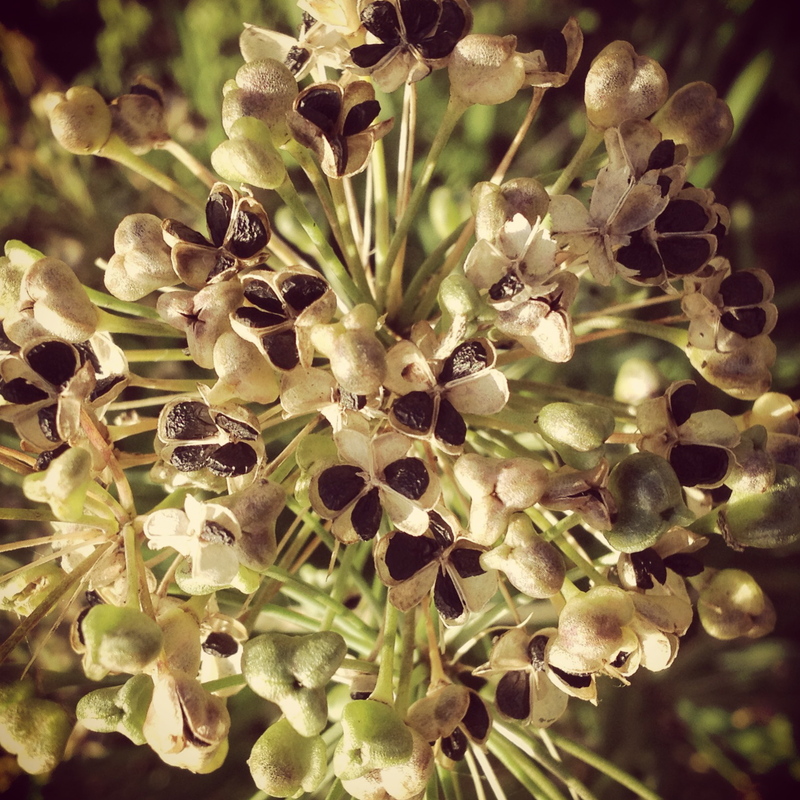 Once the leek plant flowers it becomes pretty much inedible; the leeks get a bit woody and become slightly bitter. 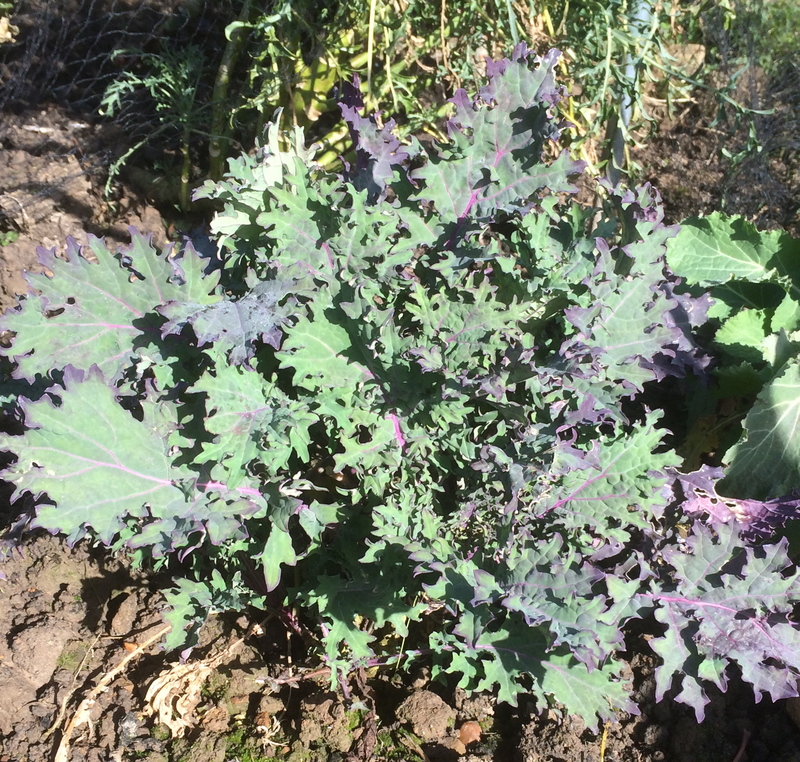 The kale survived the winter months very well. 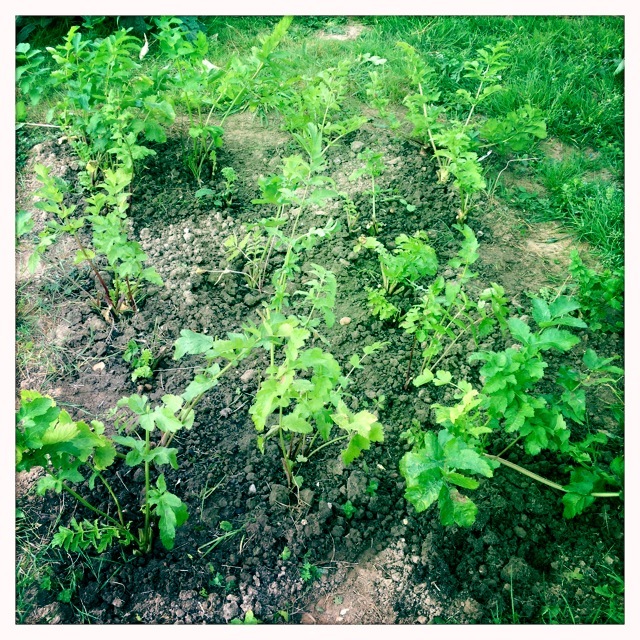 The parsnips grew better than we expected despite the host of pest problems we experienced during the critical growing months. Firstly the foliage became infested with aphids, then slugs and snails nibbled at the crowns and finally there was the arrival of the parsnip moth caterpillar! 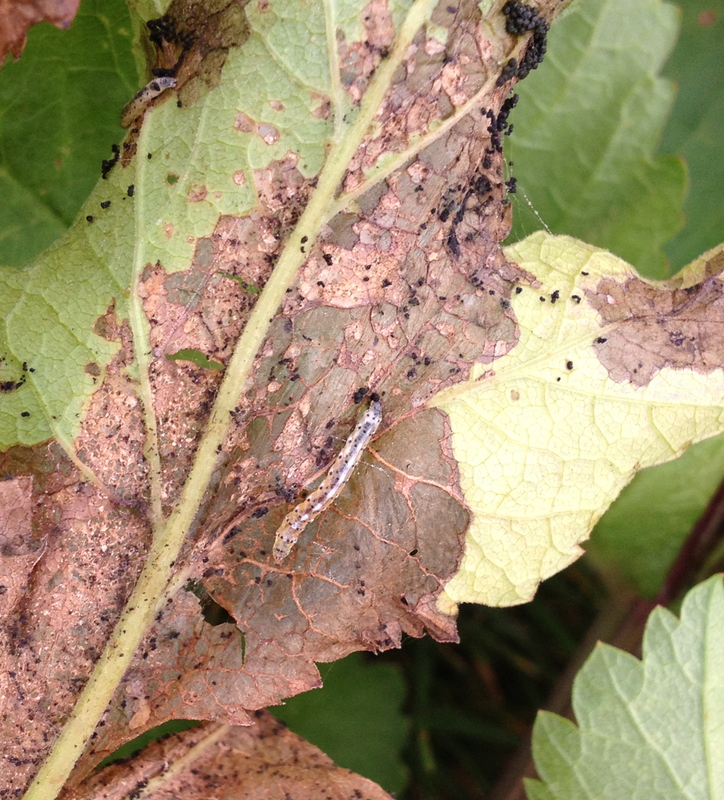 These tiny caterpillars stripped the leaves; we were left with brown tissue paper leaves. We went to the allotment on Christmas Eve to dig some up for Christmas lunch. Parsnips dug up on Christmas Eve. There were a few that hadn’t developed properly, some forking had occurred resulting in the production of a lot of roots rather than a single tap root. There were some tiny parsnips resulting from my inability to thin them out, but on the whole we had a good number of ‘proper’ shaped, good sized parsnips and they tasted great. We still have some left to dig up. 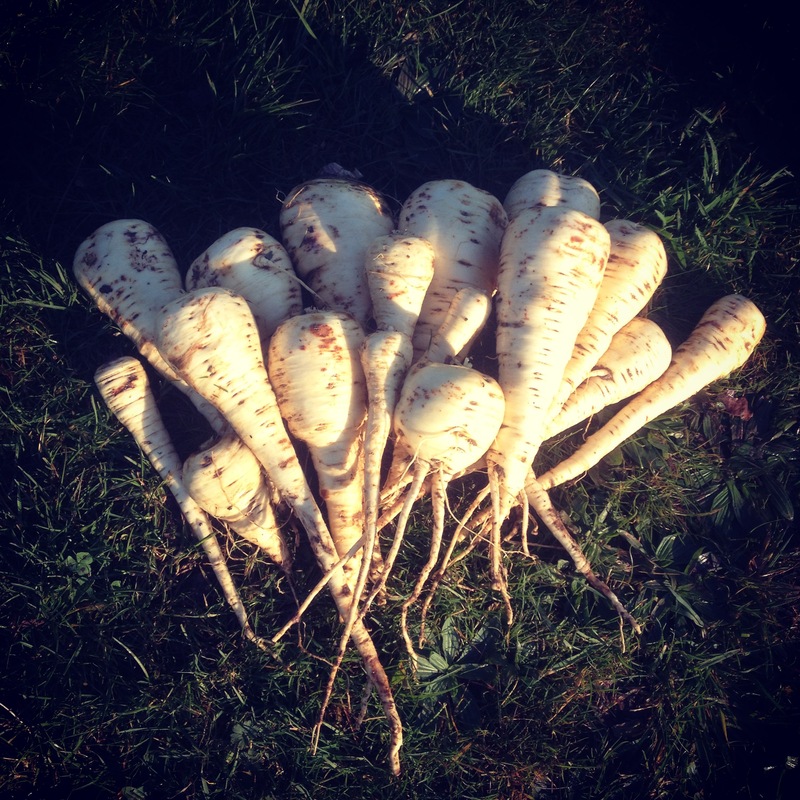 Parsnips are biennials, so if we left the parsnips in the ground they would flower in the spring and then produce seed. As one of the varieties we planted, Gladiator F1, is a hybrid any seed produced may not be true so we will dig up the remaining parsnips in the next month or so. The phacelia has done brilliantly this year, which could be because we actually sowed it at the beginning of October. Since we’ve been back we’ve tidied up the shed ready for the new season and we had a jolly good bonfire. We got rid of all the old brambles, bindweed and couch weed roots and the old rotten timber from plot one, which had formed the surround for the raised beds. We’ve also dug out the final ‘turf’ mound on the orchard plot. 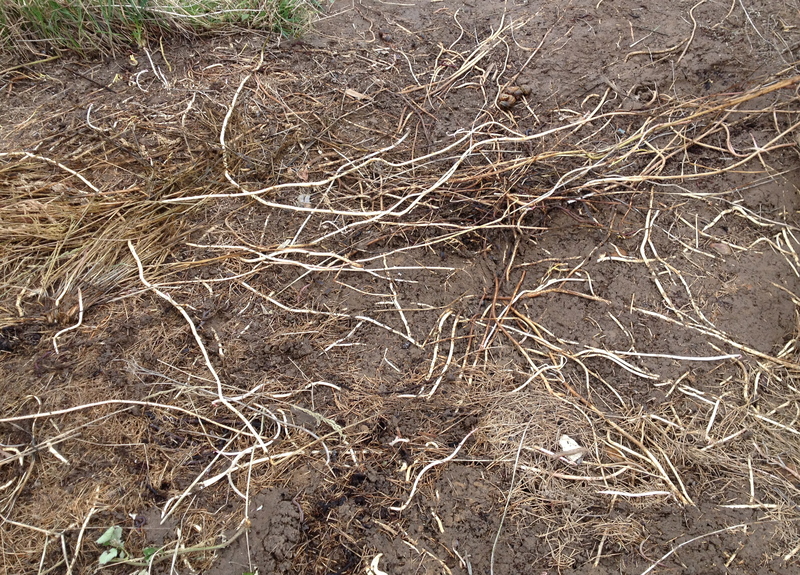 It took hours slowly sifting through the soil to remove all the bindweed and couch weed roots. There were a LOT! However, we now have a lovely new large vegetable bed. And finally there is a new communal water tank situated very close to plot one! Typically we plant garlic around mid October, but the weather has been unseasonably warm this year. Garlic needs a good spell of cold weather to promote germination, but with temperatures roughly 4 degrees celsius above the average for this time of year, there’s been no rush. We finally made the decision to plant the garlic at the end of October, which turned out to be fairly good timing. Air temperatures plummeted in early November, falling from around 20 degrees C, down to around 11 degrees C.
We had planned to plant a variety called Early Purple Wight, however all best plans and that, this variety wasn’t actually available in the garden centre this year. As an alternative we chose two softneck varieties, Germidour and Iberian Wight. Iberian Wight is a variety from the Cordorba region of Spain. It prefers a milder climate but should grow well on the south coast. It produces a large flat, white skinned bulb, which has a fairly strong flavour. This variety is known to push up out of the soil as it grows so it should be planted at least 2 inches deep. 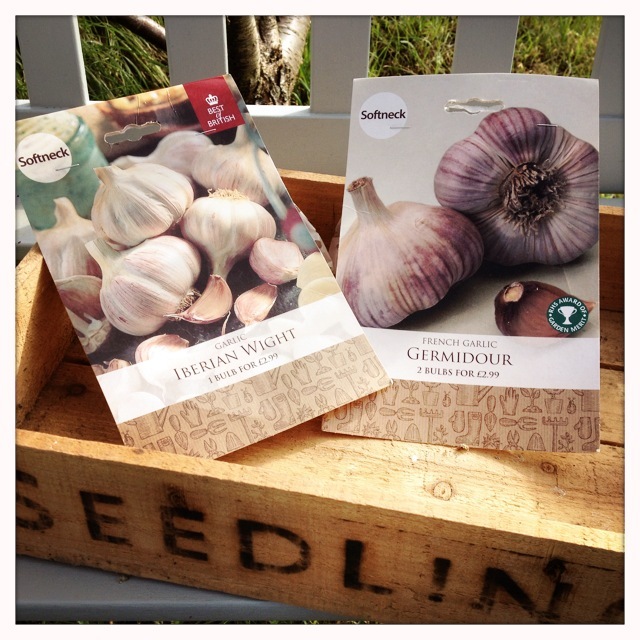 Iberian Wight seed garlic bulbs. 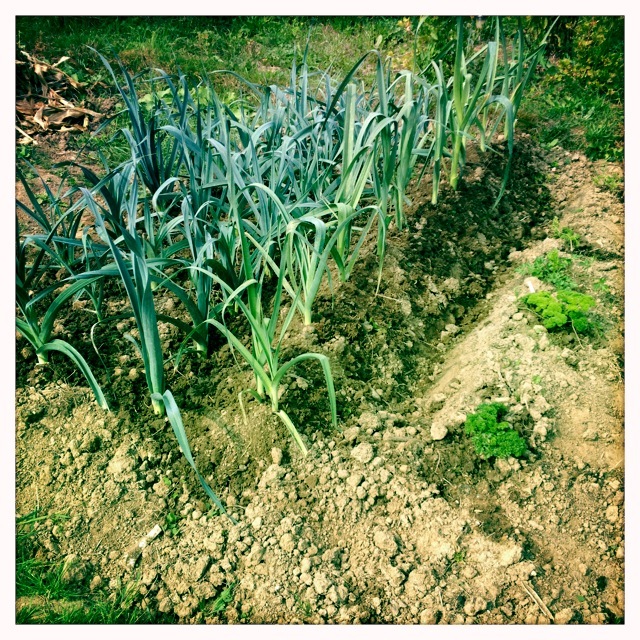 We’ve planted the majority of the garlic on the orchard plot, in the bed where we grew the potatoes this year. This soil has broken down well and as we earthed the potatoes up with bags and bags of old compost, this bed is full of organic matter, making it fairly free draining. 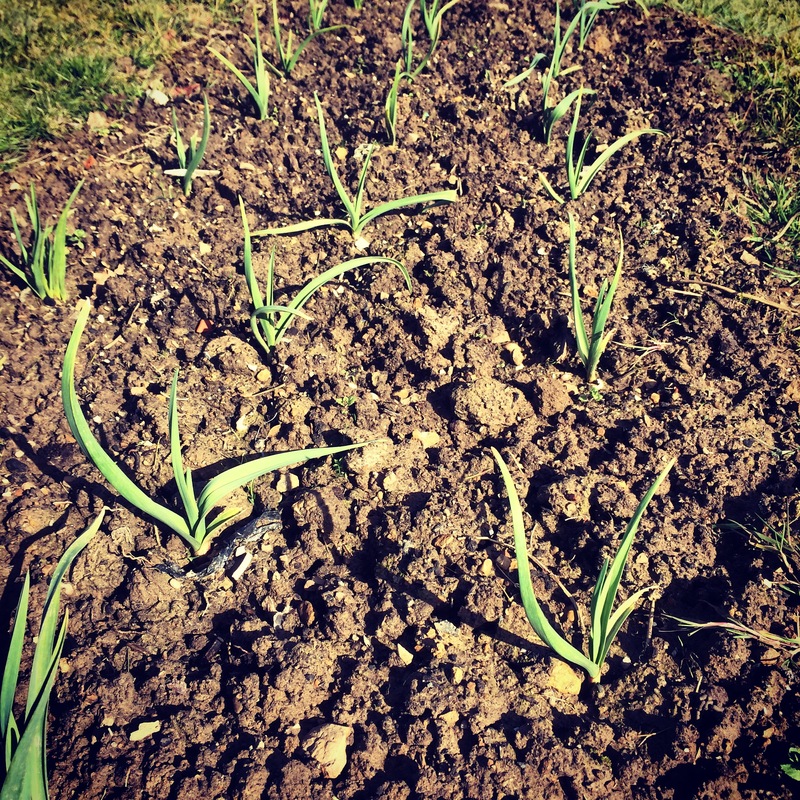 In the past we’ve planted the garlic cloves only about an inch deep because the soil is heavy clay making the seed cloves at risk of rotting. This year we’ve decided to plant them deeper, two inches given the better soil structure. This should result in larger garlic bulbs, assuming the seed cloves don’t rot following all the recent heavy rainfall we’ve experienced . 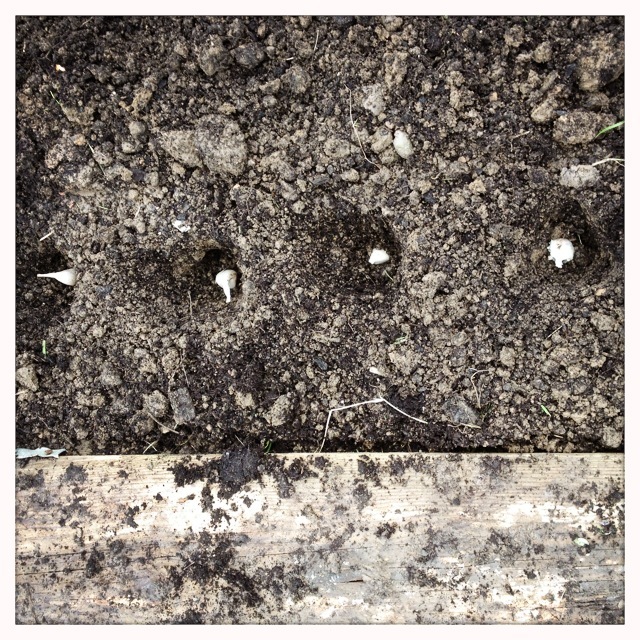 The garlic cloves have been planted 8 inches apart, and we’ve spaced the rows 12 inches apart. 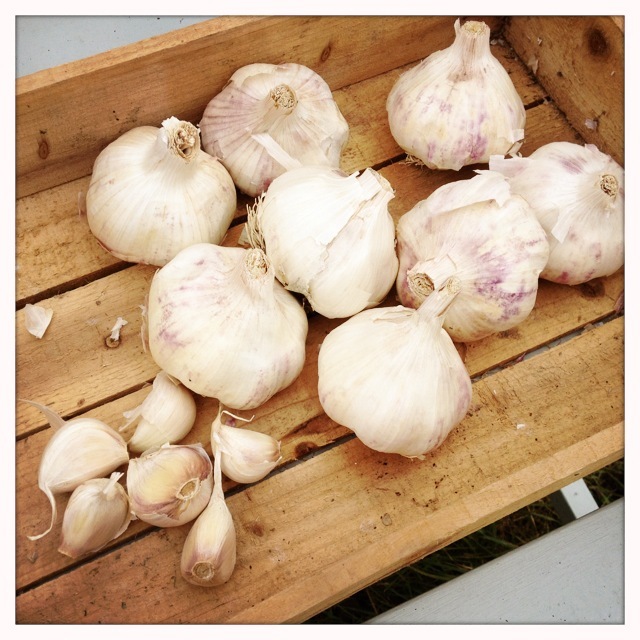 We planted a total of 55 garlic cloves on the orchard plot and a further 20 cloves on plot 2. When the growing tips emerge we shall fleece the bed to protect the plants from the frost, plus to help prevent pesky bird attack! Last year, as an experiment, we grew some garlic cloves in modules and transplanted the young plants to the allotment in the spring. These plants didn’t grow as well as the garlic we planted in situ. Based on this, we are growing all our garlic in situ this year. 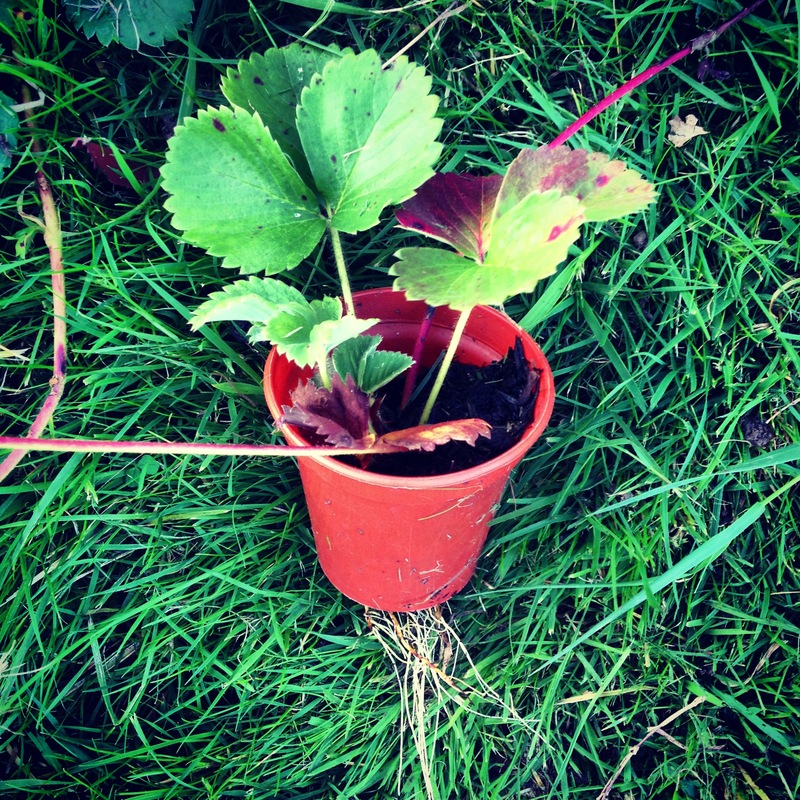 The strawberry runners that we potted up at the beginning of September have developed lovely strong root systems and can now be cut free from the parent plants. The comfrey that we cut down on plot 2 a few weeks ago is already growing back well. 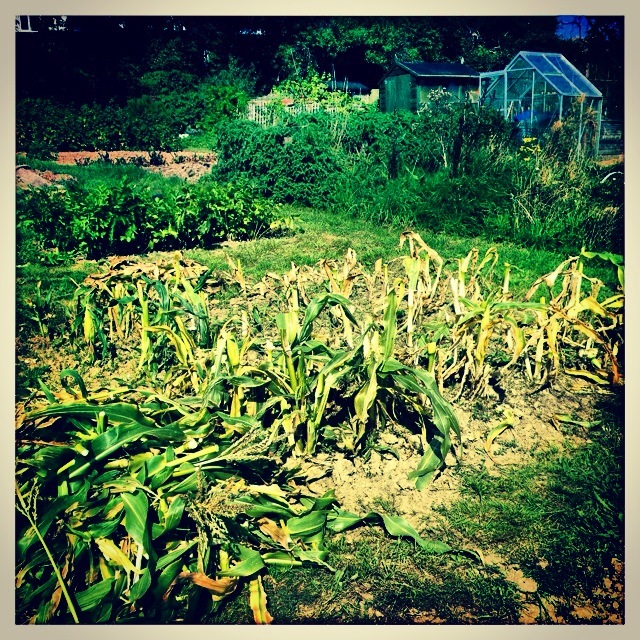 When we took over plot two there was a seam of comfrey running across the entire plot. 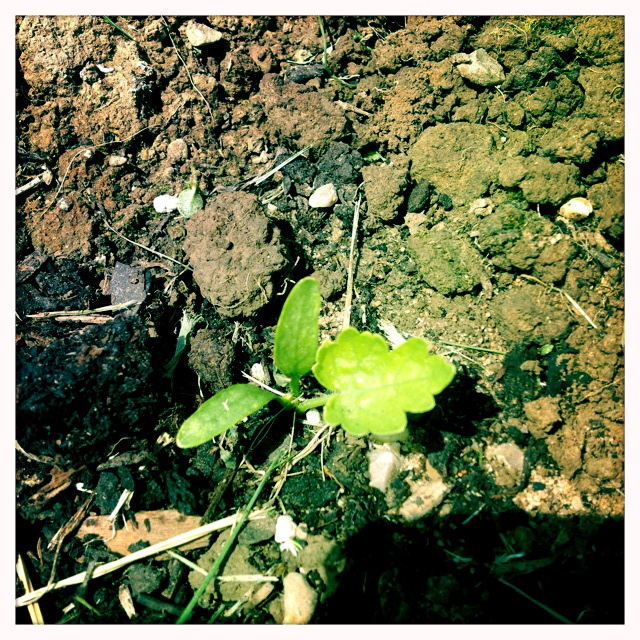 If not controlled it can become like a weed, even the slightest fragment of root left in the ground produces foliage. We’ve removed roughly half the seam over the past year, but have retained the rest because comfrey is an hugely beneficial plant to have on an allotment. Comfrey roots grow large and can reach down to depths of 8 to 10 feet. 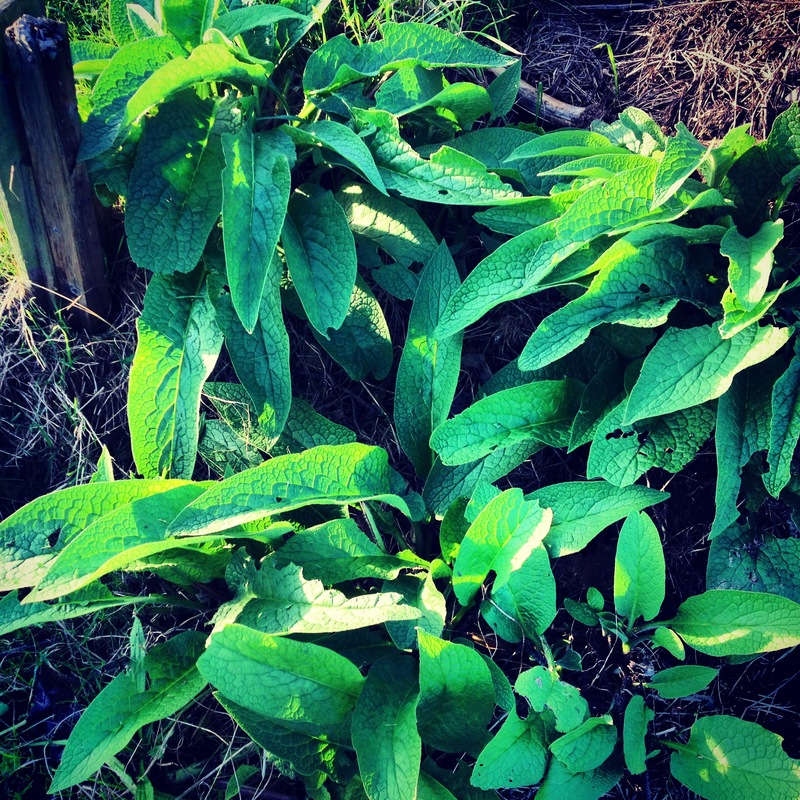 Think of comfrey as a ‘nutrient pump’. The plant extracts minerals and nutrients from deep down in the soil structure, bringing these nutrients to the surface and storing them in the leaves. It’s possible to cut the plants leaves down 3 to 4 times a year. 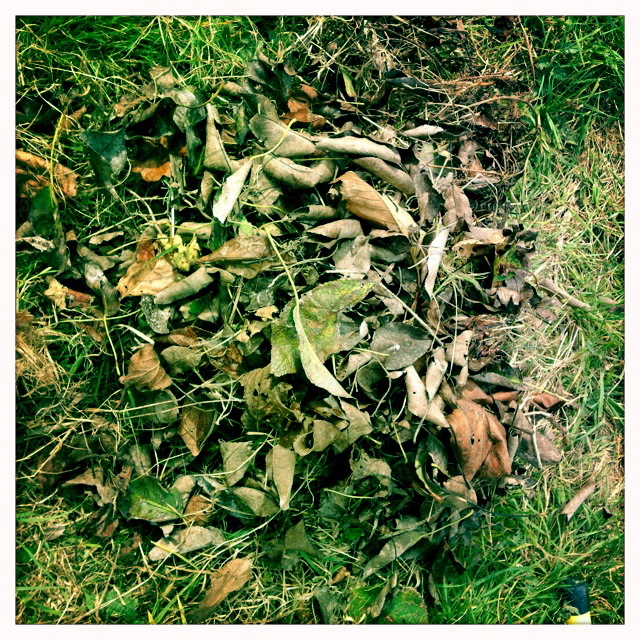 These leaves can be used as a mulch, added to compost or used to make a liquid feed. 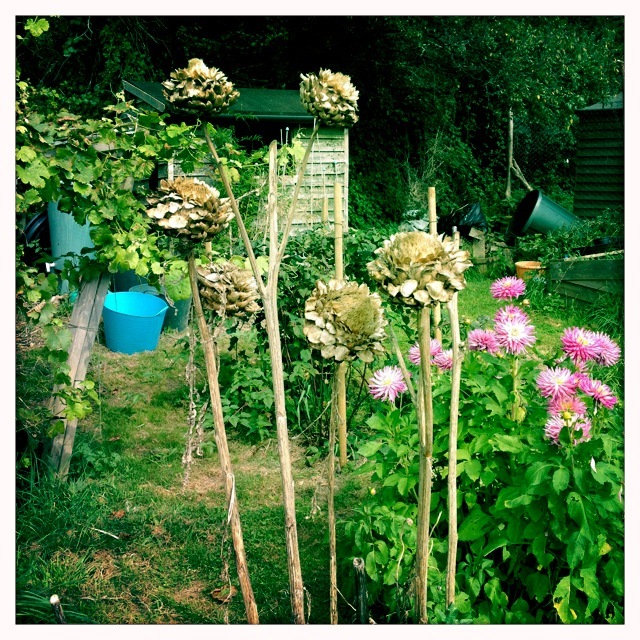 And finally I have great sympathies with this fellow allotmenteer….. The past week or so has been spent getting the plots ready for the winter. There’s been a lot of weeding, strimming, clearing and compost turning. It’s all a bit messy but it’s been rather rewarding. I’ve also been gathering seeds, runner beans, french beans, garlic chives at the allotment and cinnamon basil at home, thrilled about the basil seeds. 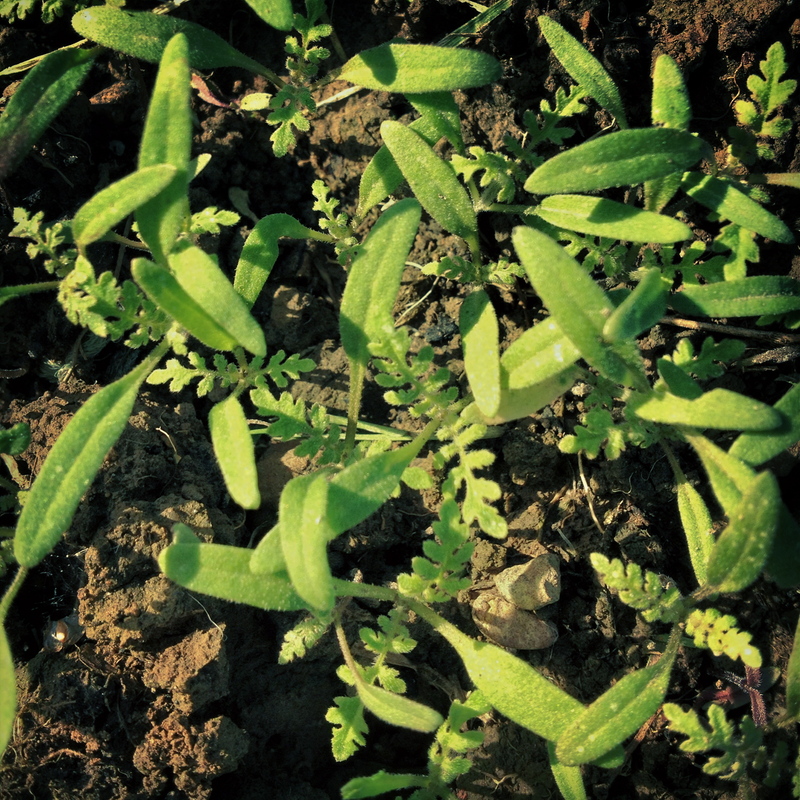 The phacelia, green manure, that I sowed at the beginning of October has germinated and is starting to get frondy. It’s about two weeks old here. It should form an excellent ground cover within the next few of weeks. 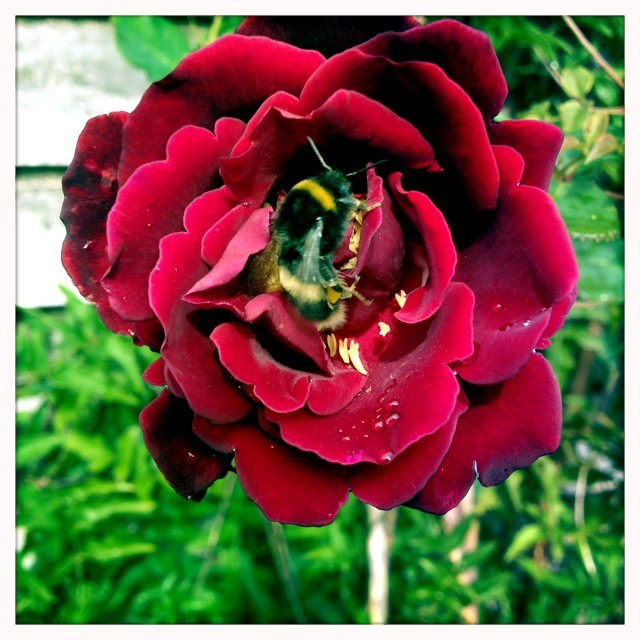 The rose is blooming and bees are busily collecting pollen..
And the grass and the weeds just continue to grow and spring up at quite a pace. 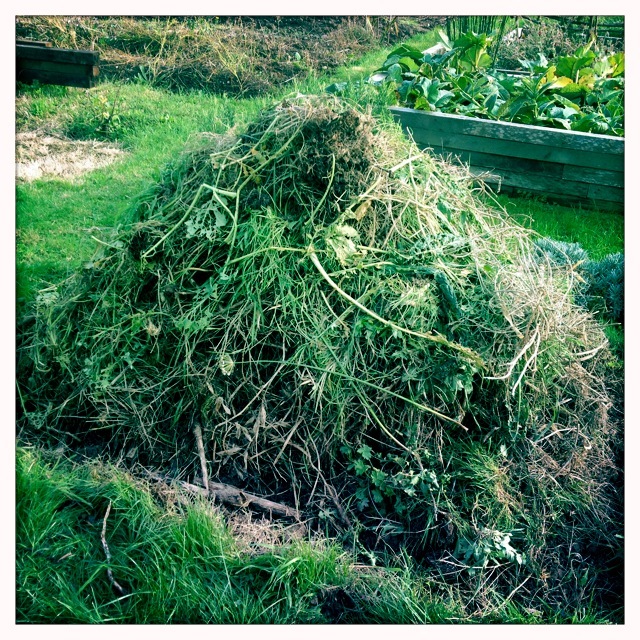 This has created quite a lot of composting material, so I decided to take a look at out composts heaps, which I have sadly neglected. They were all a little dry and non active. So I decided to reconstruct them, layering green matter (nitrogen) and brown matter (carbon) in an attempt to create some amazing compost. I’m going to write an in depth piece about composting shortly. I find it a fascinating science and have become slightly obsessed with it. 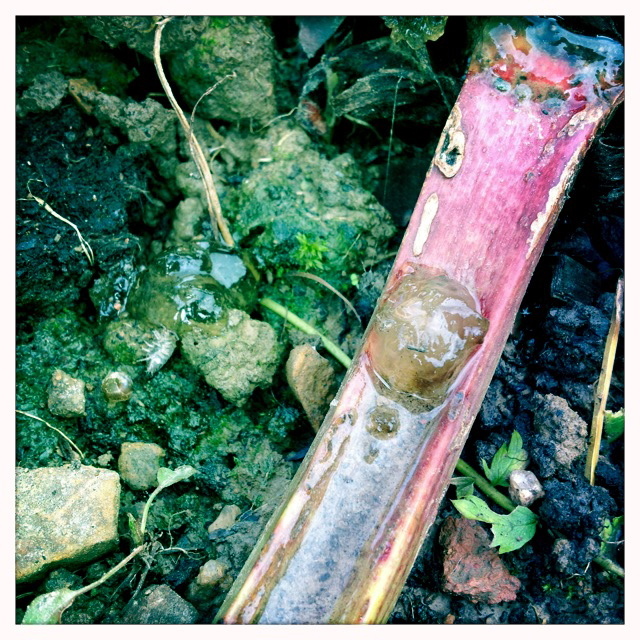 Whilst weeding the orchard plot I noticed something rather disturbing on the Victoria rhubarb. I found large blobs of a jelly like substance on a stalk and also on the ground beside the plant. My immediate thought, is this some form new pest of disease? It usually is! ever the optimist! I did a little research and apparently these jellified blobs occur when sap seeps from the stalks. In order for sap to seep from the plant, the plant must have sustained some form of damage, either from the wind or maybe a pest…. I’m hoping it’s not the latter! I will have to investigate further. Looking at this photo, the top left hand side of the stalk looks as if it’s been nibbled! 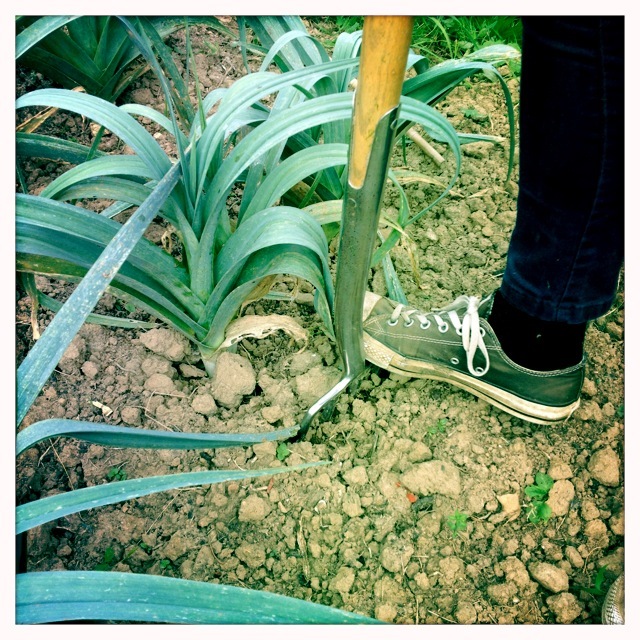 We dug up the first Bulgarian Giant leek. These leeks are long and thin, this one isn’t fully grown but I was longing to try them. This one measured around 90cm, but after cutting away the top leaves we were still left with whopping 70cm of edible leek. 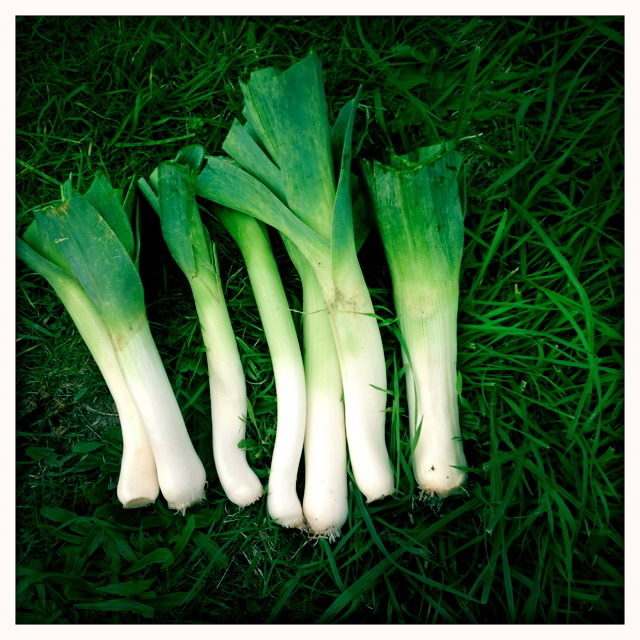 This is the equivalent of at least two standard variety leeks, or three smaller ones. They also taste great, they are fairly mild, but good and leekie! This has been a rare experimental success and we will definitely grow this variety again next year… in much larger numbers, we’re only growing about 10 plants this year. Peter and his wife, on plot 6, have been growing some rather exotic vegetables and herbs on their plot, one of which is lemongrass. Each time I walk to the orchard plot I pass plot 6 and admire the lemongrass. Lemongrass enjoys warm temperatures so now that autumn has arrived Peter has been digging it up to protect it from the colder weather. I was passing by the other day and Peter called me over. He handed me a clump of his lemongrass, I was over the moon. I popped it into a carrier bag to transport it home. He said that it needs to grow, it’s still quite young, so once home, I potted it up and have placed it in a sheltered spot on my balcony. A gardener friend of mine, Tony says it grows big… so I looked it up. Yikes it does, it grows 6 foot tall. I suspect I will need to repot it in the not too distant future! It’s a nitrogen hungry plant so it should be fed every two weeks with a nitrogen rich feed. I will bring the plant inside the house during the winter, although this will slow growth rates down. 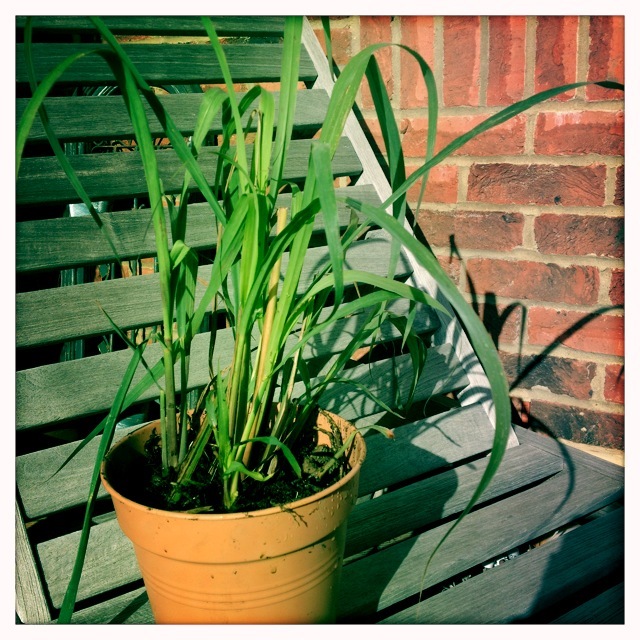 Peter said that home grown lemongrass tastes much superior to the shop bought lemongrass. I can’t wait to try it… I wish I was more patient! The unseasonably gloriously warm sunny weather sadly came to an end this week, and there has been a dramatic change in the weather pattern. Temperatures plummeted, literally overnight, falling from the mid 20’s down to a chilly 16 degrees celsius. Rain has also arrived, in bucket loads! Gardening in cold wet weather has never really appealed to me, one has to ask the question why?! So my visits to the allotment will most probably become less frequent over the coming months, just popping along when there’s a spell of dry weather. Fortunately there’s not a lot to do at the allotment. 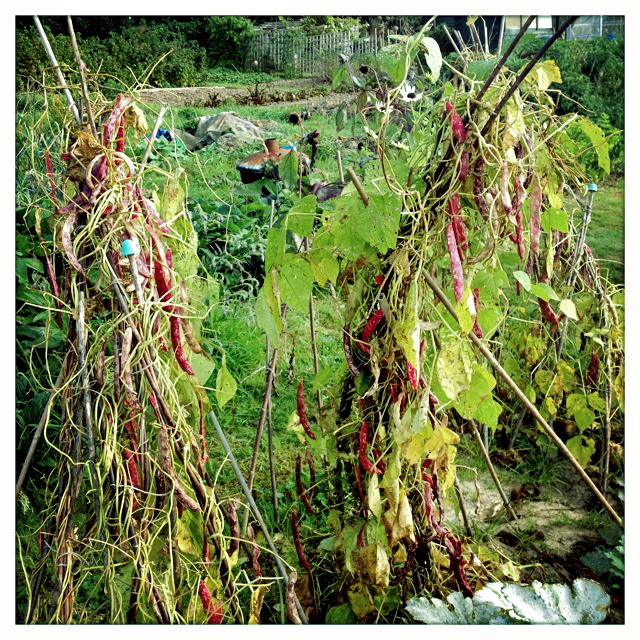 The only crops that we have left growing include leeks, parsnips, kale and also the french bean and runner bean wig-wams. 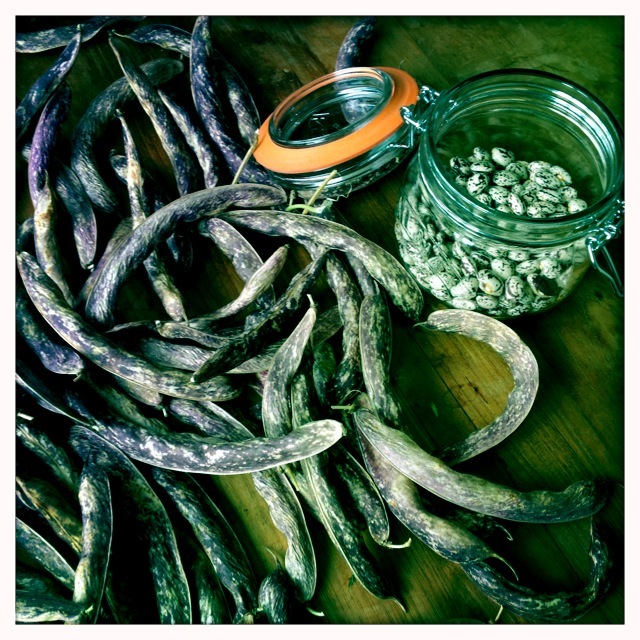 The beans are well and truly over but I’m slightly obsessed with saving seed, so I’ve left the overgrown bean pods to dry out and then I’l harvest the seed. The leeks, kale and parsnips will all over winter well. In fact they will all benefit from a period of cold weather, it will help improve their flavour. On my last visit I had an overwhelming desire to dig up a parsnip. During each visit I look at them longing to know what is happening underground. It’s far to early to start harvesting as there hasn’t been a frost yet, they will probably taste bitter, but I’m rather impatient. Parsnips need a good spell of cold weather before harvesting. Colder temperatures activate enzymes that causes starch to convert into sugars, making the vegetable taste much sweeter. I sowed the parsnip seeds way back in mid April. I used a method that I found in a gardening magazine. They suggested creating a hole, with a dibber, and filling the hole with a mixture of compost and grit. I placed 3 to 5 parsnip seeds in each hole and covered with more of the composty/gritty mixture. The seeds were terribly slow to germinate, it took over a month. Germination rates were extremely poor too. I sowed more seeds towards the end of May and this time germination was reasonably quick. Increased soil temperatures had obviously improved the germination rate. 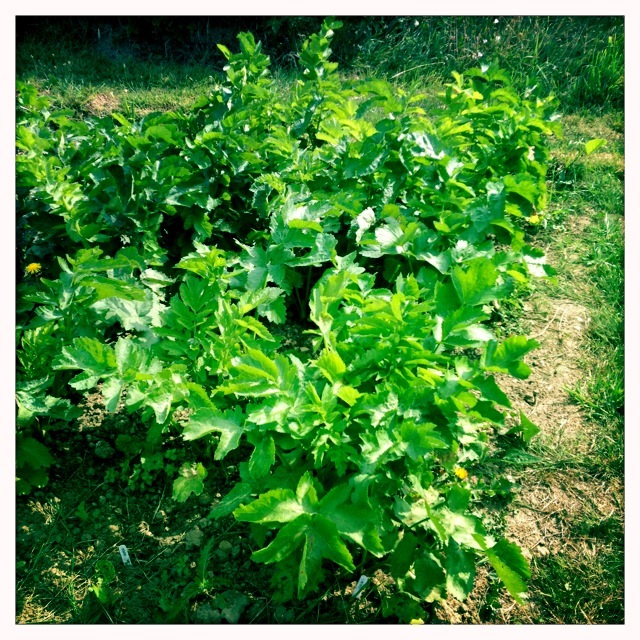 Over the next few months the parsnips continued to grow at quite a pace, producing an enormous amount of foliage. However, it wasn’t all be plain sailing, there have been a few obstacles along the way. 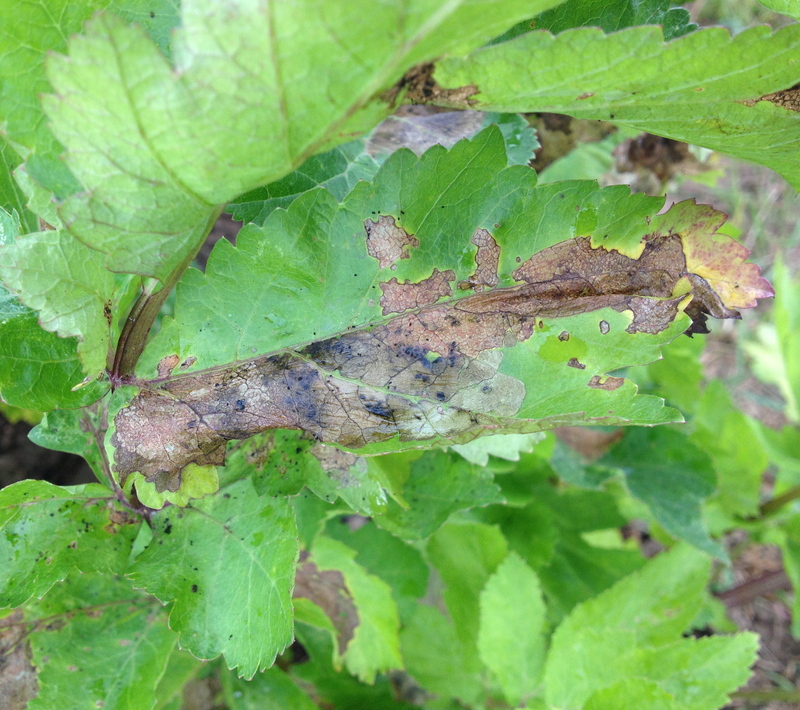 Aphids, slugs and snails and on my last visit and new problem. I discovered that a large amount of the foliage had formed brown, thin papery patches. I was talking to my allotment neighbour Darrin, and a similar thing had happened to him last year. He said have a look underneath the leaf and it suddenly became apparent what was causing the damage. Lots of tiny caterpillars, they were no more than a centimetre long. Despite being small, they certainly demonstrated a voracious appetite, stripping leaves at quite a rate. I had to do a little research when I got home; neither Darrin nor I had any idea what type of caterpillar this was. After surfing the internet for some considerable time, trust me there’s not a lot about this, I came to the conclusion it’s most likely to be a parsnip moth caterpillar. Rather odd because they usually feed on wild parsnips. 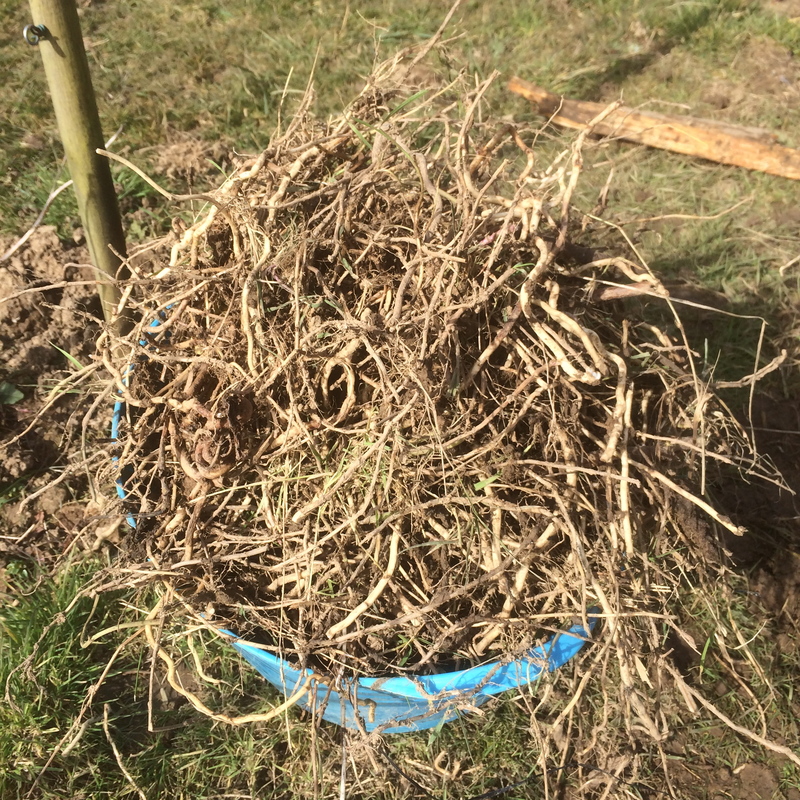 Anyway, without knowing what it was at the time, I took drastic steps and I pruned the parsnips, removing all the infected foliage. Not perfect in any way, but not quite as bad as I had feared. 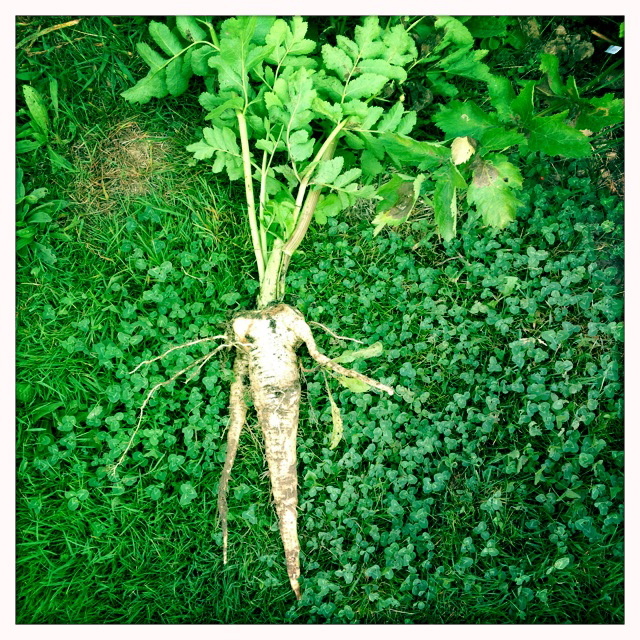 The main root is fairly straight, but there is clearly some forking, creating a ‘parsnip man’ with two arms and few extra hairy roots. 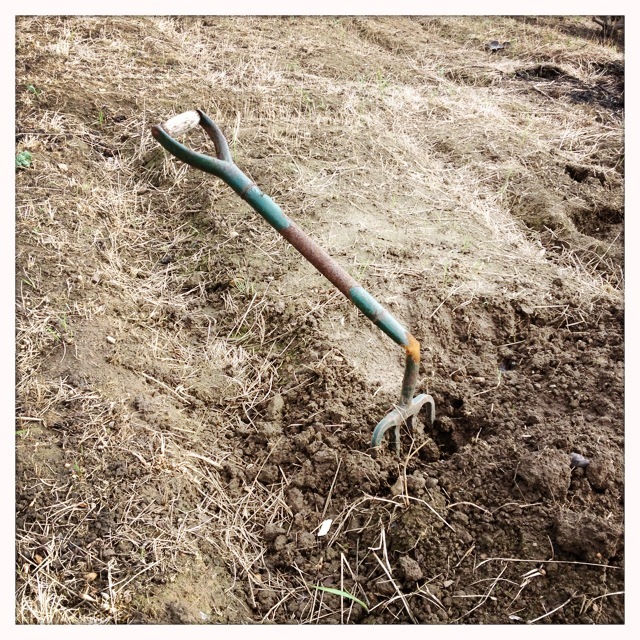 The forking probably resulted from the soil not being fine enough. If the root hits an obstacle it tends to grow around it. Now we need to wait for that all important frost to arrive before we dig up any more. 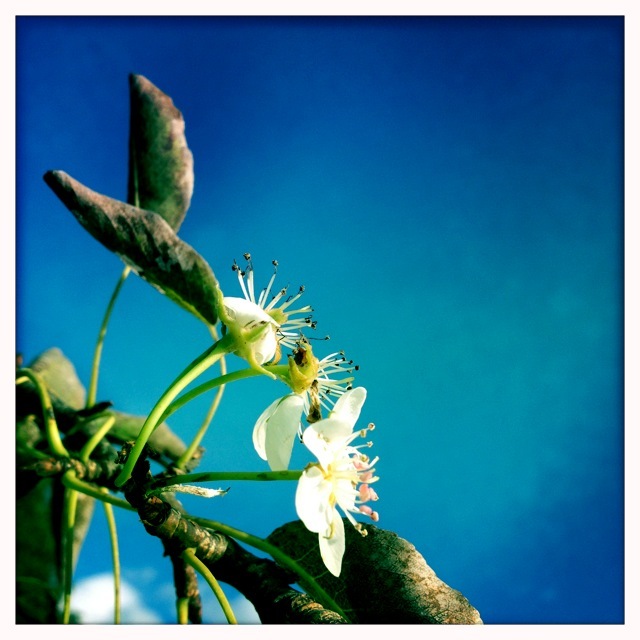 On the orchard plot, the fruit trees are beginning to shed their leaves. The large pear tree has suffered from scab this year so it’s important that we rake up all the scabby sooty diseased pear leaves from the ground. This is to try and prevent the pear scab spores from infecting the pear tree again next year. These leaves will be destroyed. 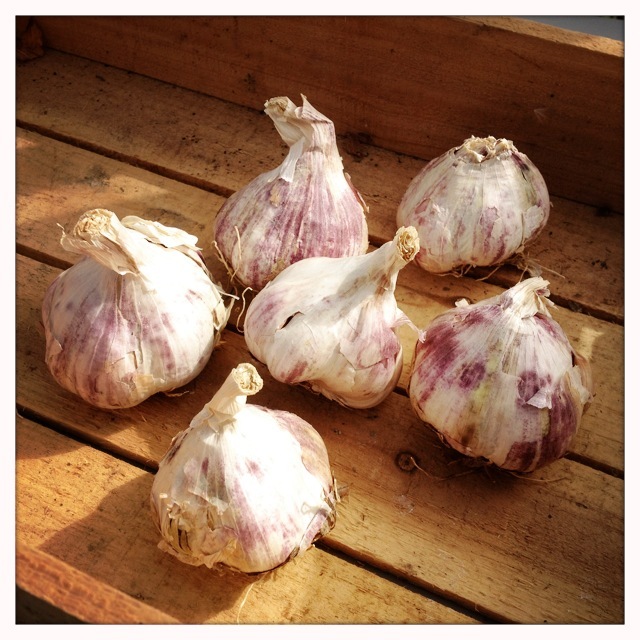 And finally, it’s almost time to start planting garlic bulbs. This year we intend to mainly grow a softneck variety called Early Purple White. We’ve had the most success with this particular variety over the past couple of years. It produces good sized, delicious tasting, bulbs that store really well. As crops are harvested into late summer, early Autumn we are generally left with a number of empty vegetable beds over the winter months. It’s really important not to leave soil exposed as this can lead to soil erosion and the leaching of vital nutrients. 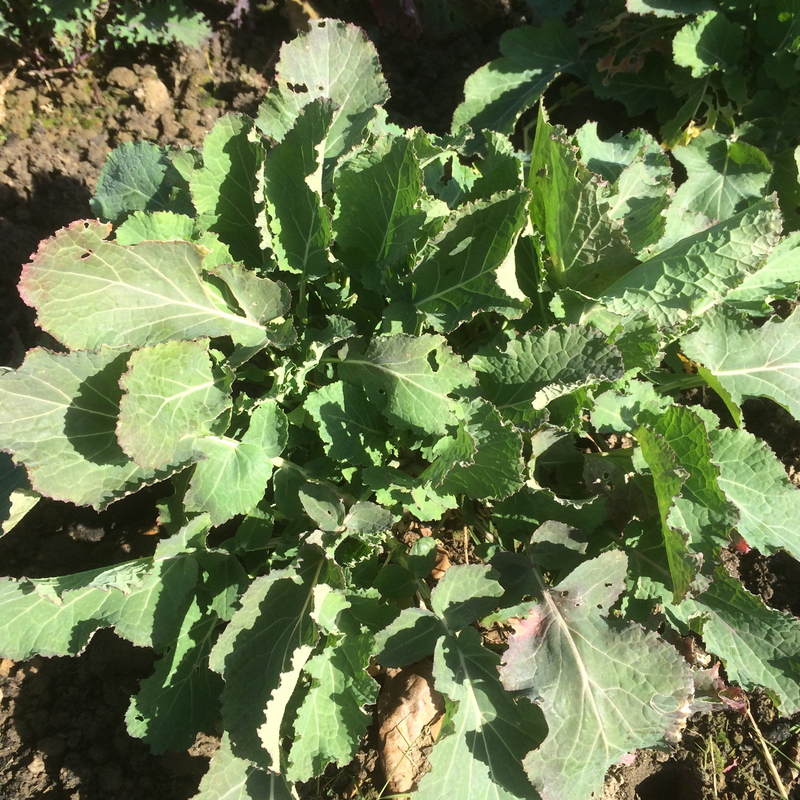 Additionally, those pesky weeds are likely to emerge and rampage over the empty vegetable beds during the autumn and winter months, again removing much needed nutrition from the soil. 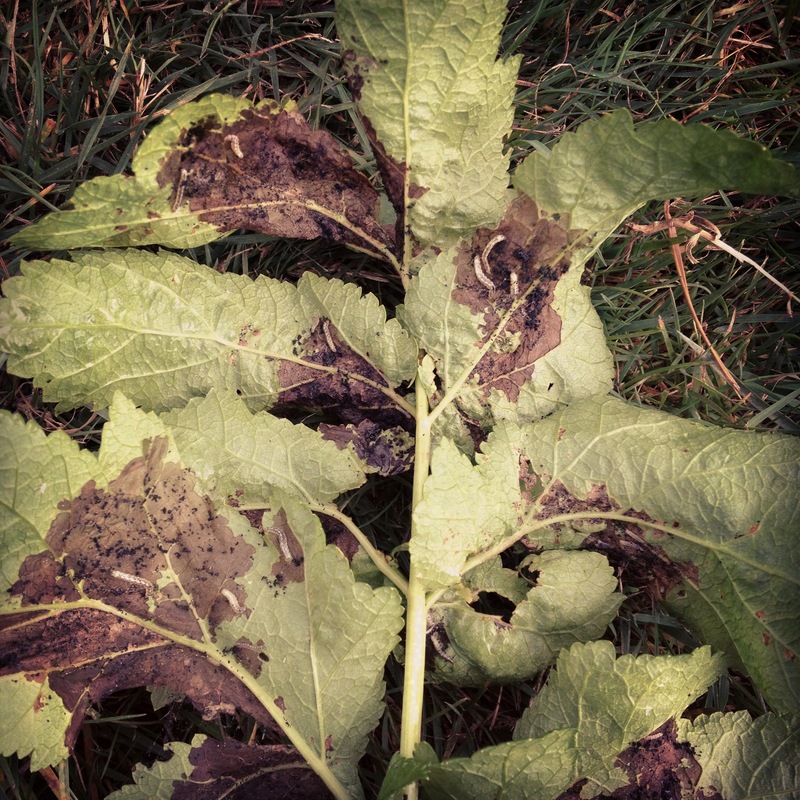 There are a number of ways exposed soil can be protected from weeds and the elements. Cover the bare soil with some form of mulch. Mulch is basically anything that covers exposed ground, which may include cardboard, straw, wood bark, grass clippings, etc. We tend to use a heavy duty fabric membrane that we buy from the garden centre. 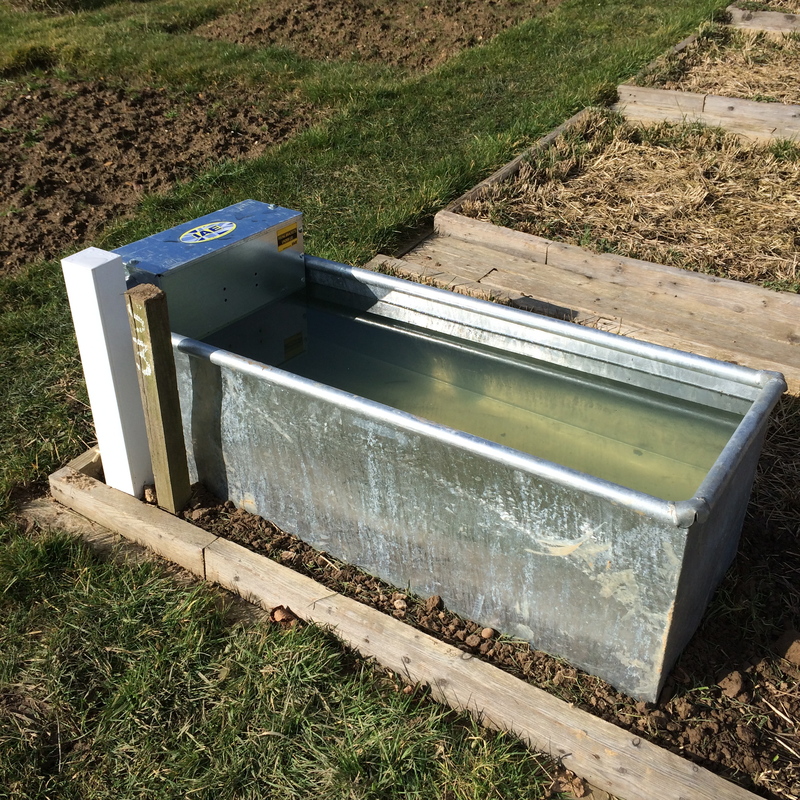 However, this is an expensive option and we’ve found the strong coastal winds tend to whip up across the allotment during the winter months causing the membrane to be ripped from the pegs that secure it. Last year we had to resort to securing it with planks of wood, bags of compost and full watering cans, just to prevent the membrane from taking off! Using mulch is fairly effective. It keeps the ground weed free, although saying that, let me remind you about the bindweed roots that we found under some carpet when we took over the orchard plot! Note: Never dig mulch into the ground. Organic matter is essential for fertile, productive, healthy soil. All organic matter takes time to breakdown, and all organic matter is broken down by micro-organisms. Fully decomposed organic matter is known as humus, it’s black and crumbly. It’s not possible for humus to decompose further. Humus stores the soils nutrients, moisture and helps improve the soils structure and drainage. Mulch on the other hand is organic matter that hasn’t decomposed. It is yet to go through that process. Therefore it has little to no benefit to plants if dug into the soil. 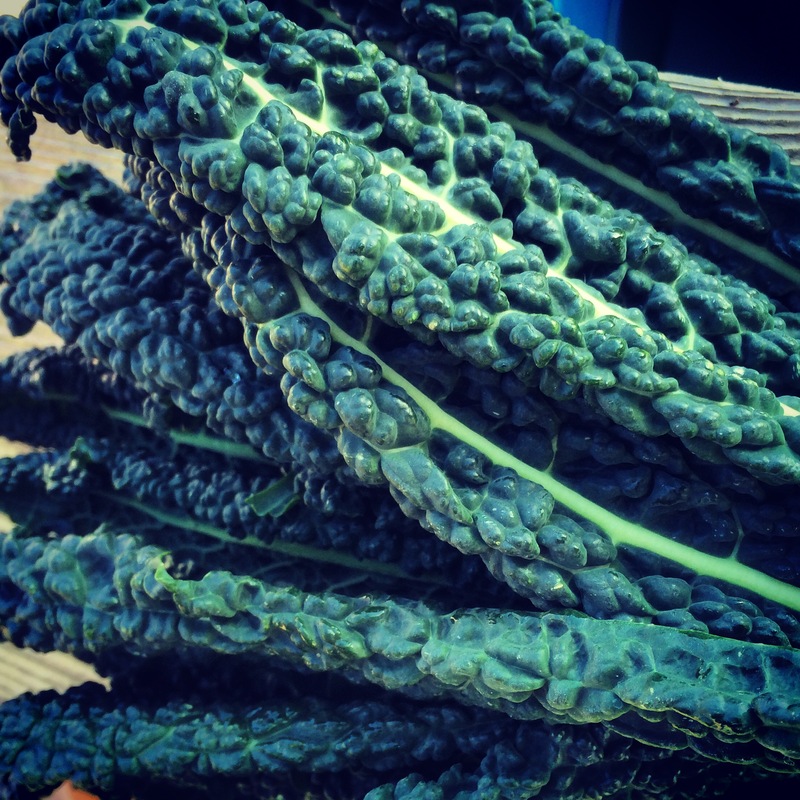 The decaying organic matter may actually hamper vegetable growth rates as the busy micro-organisims use nitrogen and phosphorus and other nutrients, also required for the successful growth of vegetables. 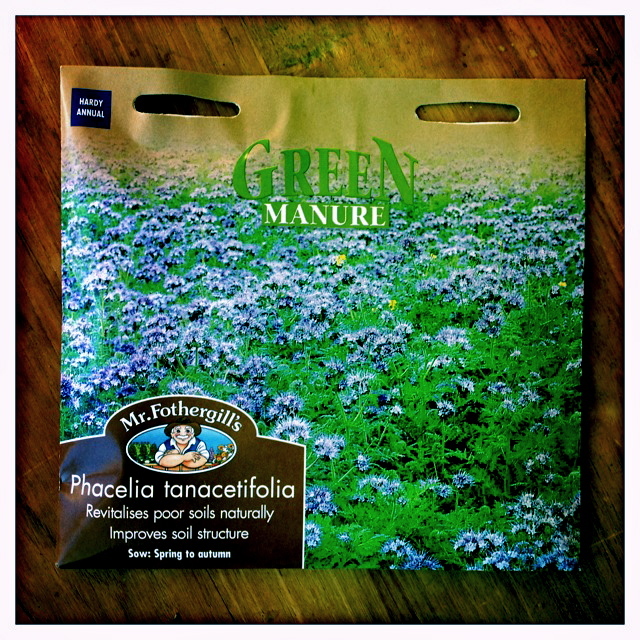 Another option is to sow green manure. Green manure is essentially a fast growing plant used to cover bare soil. It helps improve the health of the soil. The foliage covers exposed soil helping to suppress weeds, and the plants root system helps prevent soil erosion. There are a whole host of plants that can be used as green manure, and one should be mindful of the cultivar before sowing. For example, there are a number of plants such as, Alfalfa (Medicago sativa), Alsike clover (Trifolium hybridum), Bitter Blue lupin (Lupinus angustifolius), Crimson clover (Trifolium incarnatum), Fenugreek (Trigonella foenum-graecum), Trefoil (Medicago lupulina) and Winter field bean (Vicia faba) that all belong to the to the legume culivar. These plants are nitrogen fixers and this should be noted when considering crop rotation. Mustard (Sinapis alba) is part of the brassica cultivar; to avoid club root, this too should be considered when planning crop rotation. This is all rather complicated for my simple mind, so to keep things easy, especially with crop rotation in mind, we always tend to opt for a green manure that is neutral and that will not impact crop rotation. We sow Phacelia (Phacelia tanacetifolia). Ultimately, we are looking for a green manure that helps suppress weeds and prevents soil erosion, phacelia ticks both boxes. It also has the added bonus of helping improve soil structure. 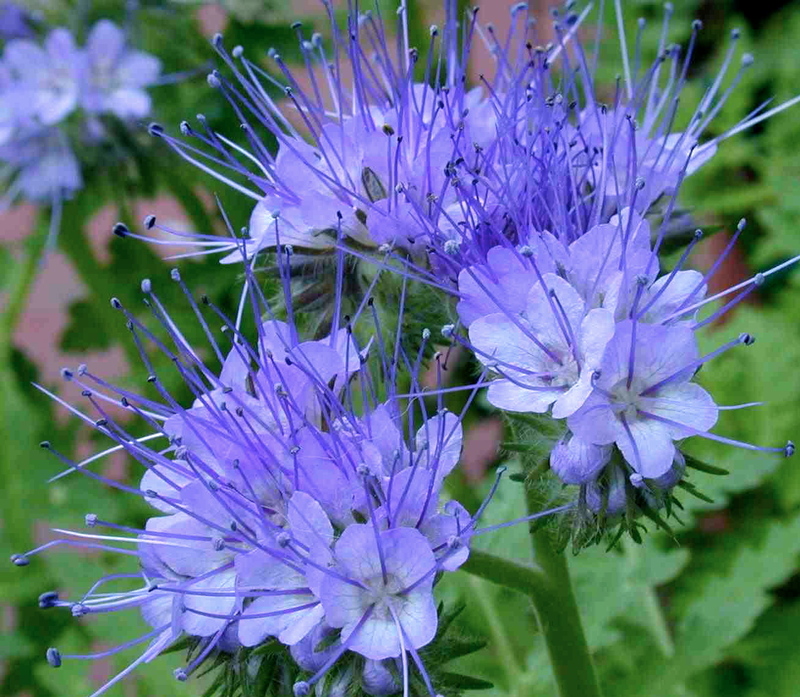 Phacelia, otherwise known as purple tansy, belongs to the Boraginaceae family. Other members of this family include, borage, comfrey, forget-me-not and heliotrope. Germination is aided by cooler temperatures and darkness. 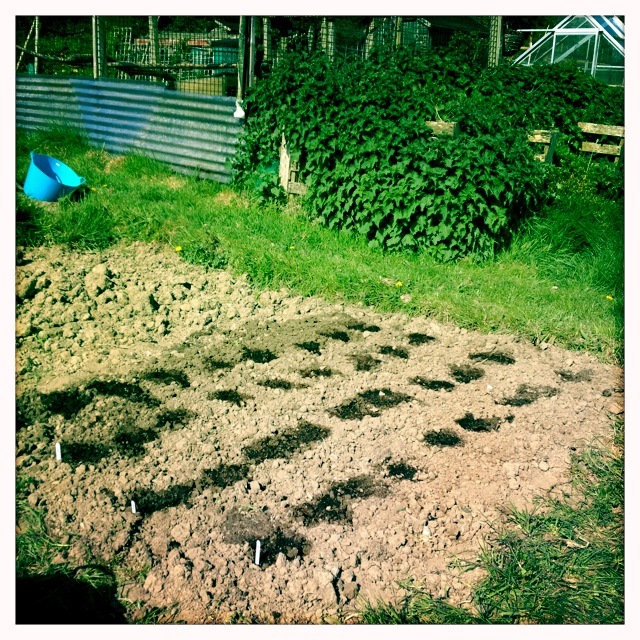 Sowing is recommended between, March to June or August through to October. Cast the seed at roughly 1 gram of seed per square metre and cover with roughly 1cm of soil. It likes most soil types providing there is reasonable drainage. Then either rake or as I do, gently fork over. The seeds take anywhere from 12 to 30 days to germinate. The ground should be kept damp throughout this period. The plants should be fully grown within 3 months. 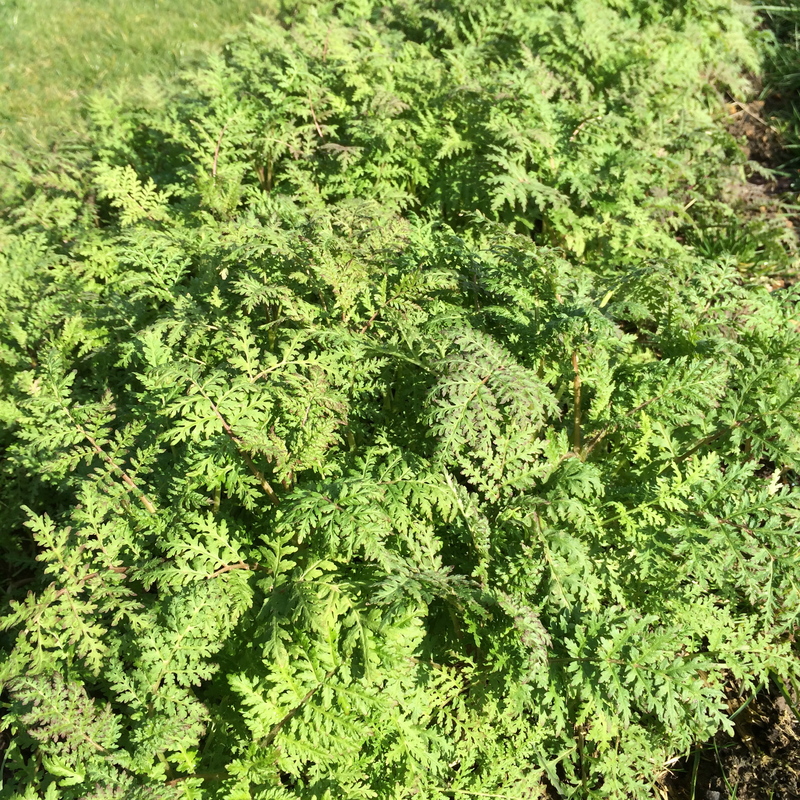 Phacelia has a dense fern like foliage, perfect for suppressing weeds. Providing it’s not too cold, it should overwinter well. 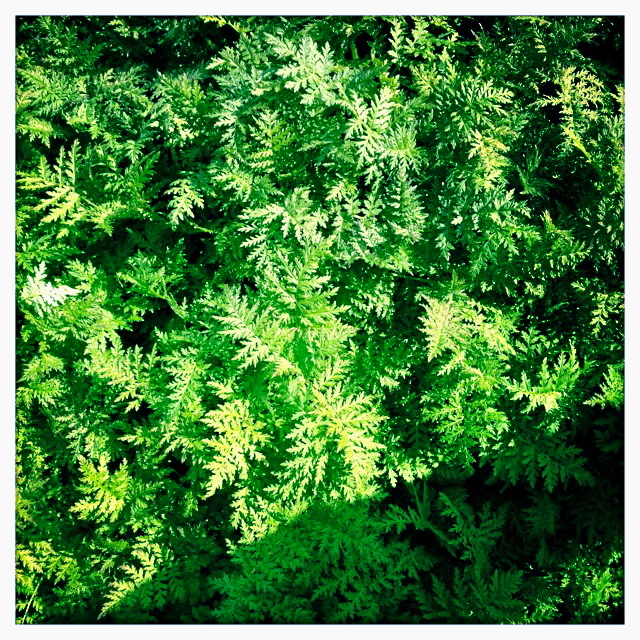 In the spring, cut down the foliage before it flowers and dig into the soil. The advantage of this is that all the nutrients absorbed from the soil will be released back into the ground, plus the broken down matter will help improve the soil structure. Once dug into the soil, allow at least two weeks before planting or sowing seeds to enable the plant structure to break down sufficiently. If allowed to flower, this plant will not only look spectacular, but it will hum with the activity of busy bees. September is one of those months! 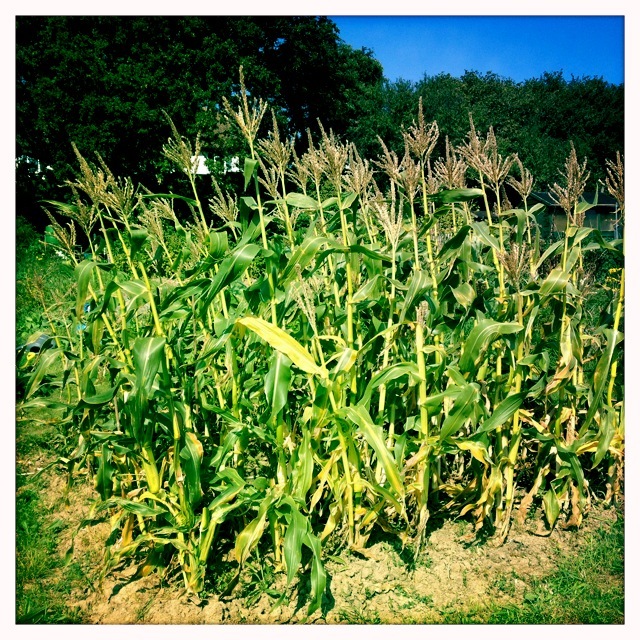 It has mixed emotions for me; it’s an in-between month… there’s the excitement of harvesting this years labours and maintaining the crops that will overwinter. But once that’s done, there’s also the slight heavy heartedness that the season is coming to a close. This year we’ve enjoyed an amazing summer of warmth and sunshine and the weather just keeps giving. It doesn’t seem like September at all, temperatures have been above average and there’s been very little rainfall, it’s possible this could be driest September since records began. But what does remind us that it’s September is all the old dried out, tired looking, decaying plants that are no longer producing vegetables and the empty beds that need to be prepared for winter. So we’ve started the the big autumn clear up. We’ve picked all the cobs of sweetcorn and they are now stashed in my freezer. 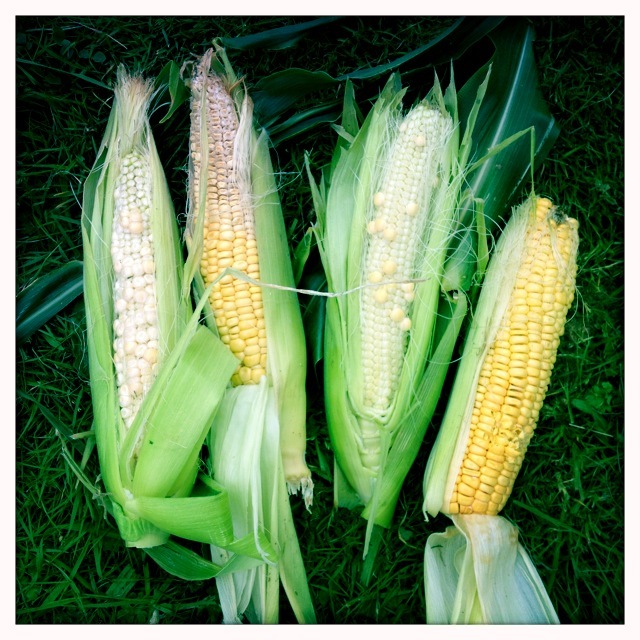 The cobs that were left on the plants into mid September were either underdeveloped due to poor pollination or they became over ripe and turned horribly starchy. Only one place for them, the compost heap. 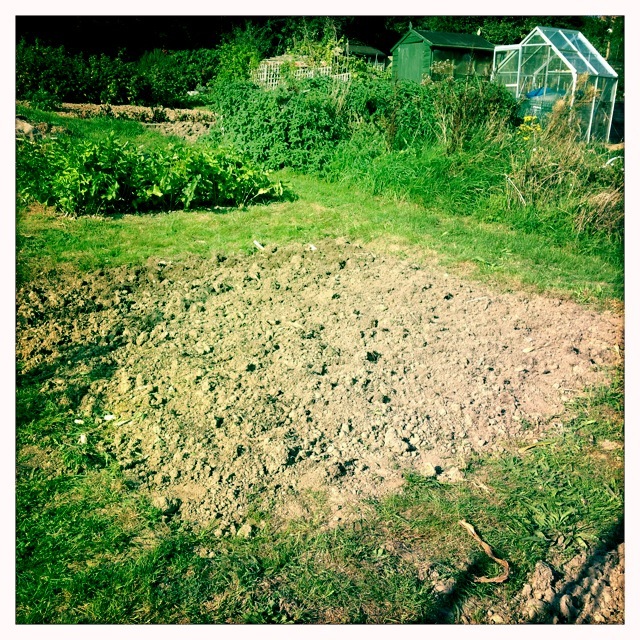 But after an hour or so this tall grassy landmark was finally gone… we sowed a green manure, Phacelia, on this empty bed so we don’t leave it exposed over the winter months. Despite enjoying warm daytime temperatures, we made the decision to remove all the remaining borlotti bean pods. Our main concern was the drop in night time temperatures. A frost could easily damage the crop. So all the pods were harvested. We had a huge bag full that I spread out on my kitchen table at home and there they were left to dry. Two weeks later they were ready to pod and store in airtight jars. Berlotti beans are not known for their abundant production, each pod contains approximately 6 or 7 beans. 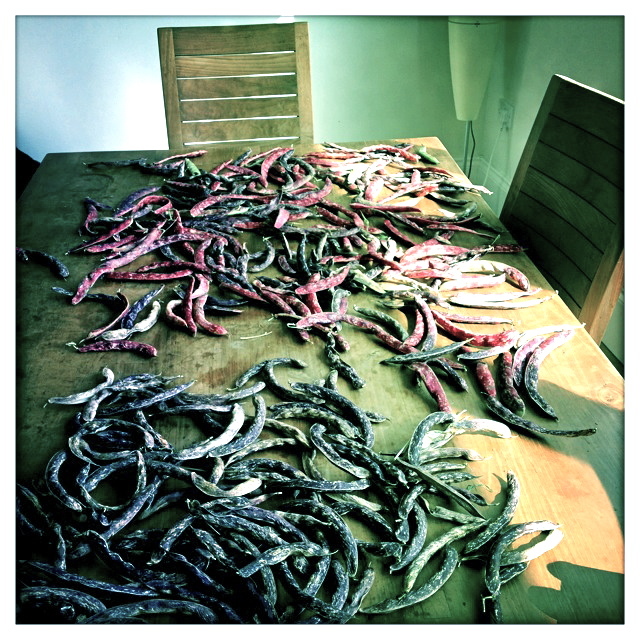 In terms of quantity produced, we averaged a jar of beans per wig-wam (we grew anywhere between 7 to 10 borlotti plants per wig-wam, difficult to tell exactly as some young plants were devoured by slugs and snails along the way), each jar of beans weighs just over 400g. So we produced a total of 1.25kg of beans. Not bad all things considered but one could always have more…. So next year I think we need to triple production, 9 wig-wams. This should provide a decent crop to see both of us through the winter and to have some spare to share with fellow allotmenteers and friends. 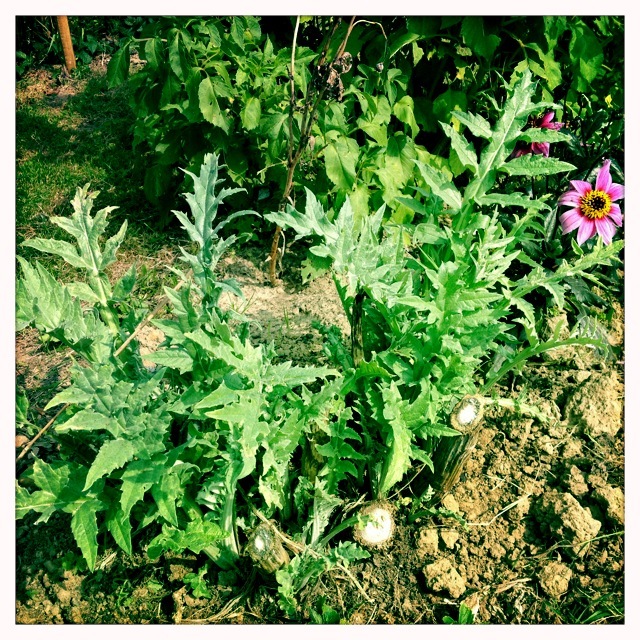 Globe artichokes are perennials. This plant is now three years old so we will look to start dividing up this plant next spring to help retain the plants vigour. 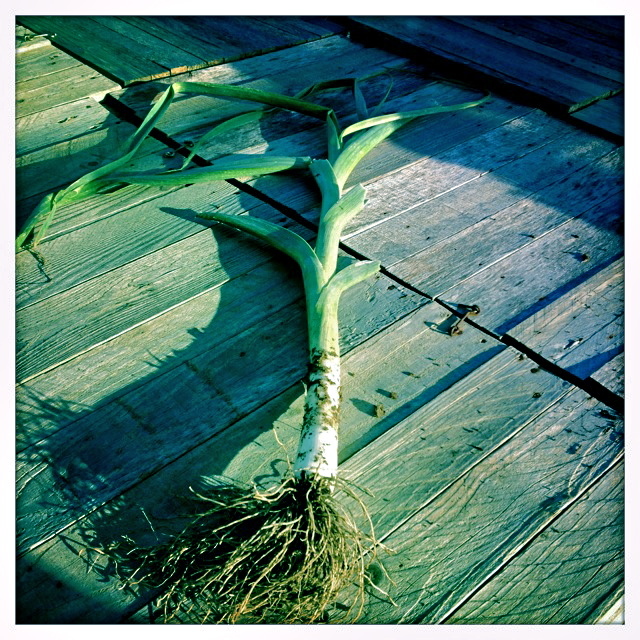 We dug up the first of the leeks. These are Barry Leeks, leeks. I hate to admit it, but we do seem to have slightly more white by using Barry’s trench sowing/growing method!! 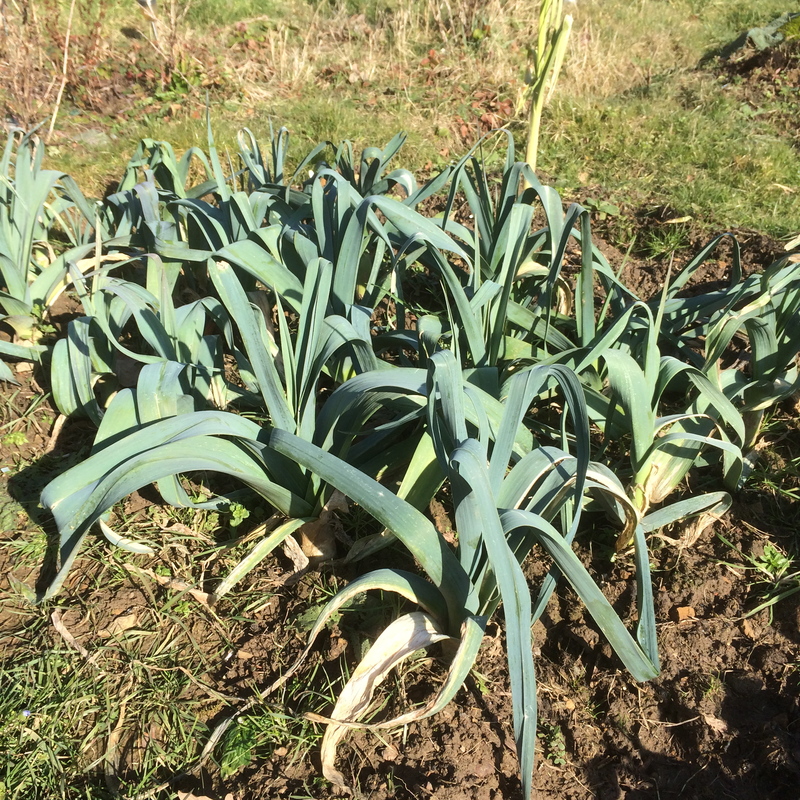 Although, maybe we should wait until I start digging up the experimental Bulgarian Giant Leeks… thinking that they may produce much more white….. they are certainly quite tall… and growing! Each visit there’s always more earthing up to do!! And finally, you know how much I love poppies. 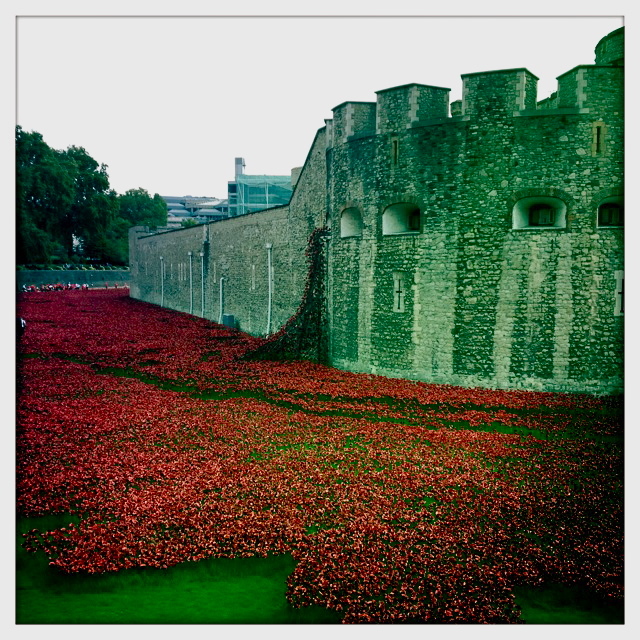 Well, this week I travelled to London to see the ceramic poppies at the Tower of London. It’s an incredible, unique art installation called Blood Swept Lands and Seas of Red.. It marks the 100 year anniversary of the outbreak of the First World War. 888,246 hand crafted ceramic poppies have been made and throughout the summer months these poppies have been progressively placed in the moat of the Tower of London. 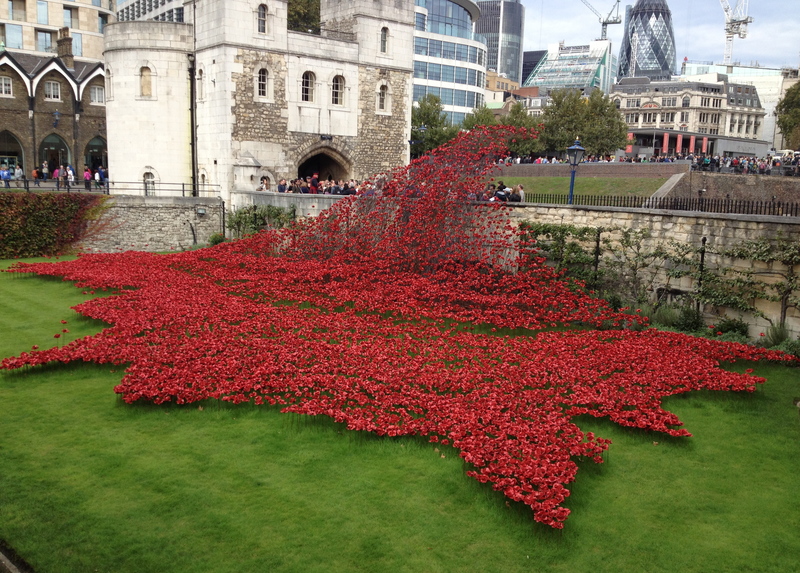 Each poppy represents the lost life of a British soldier during the First World War. It’s incredibly moving to see. If you are in London, it’s a MUST SEE. The closest tube station is Tower Hill, on the Circle line (yellow) or District line (green), it’s a short walk to the Tower from here. 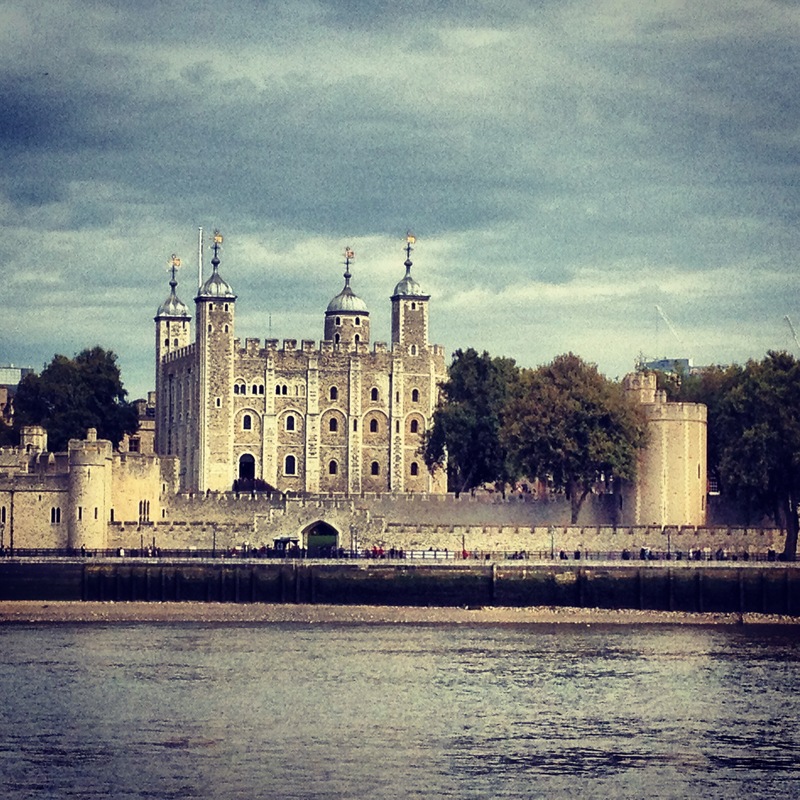 The Tower of London in the heart of the City of London, actually very close to where I used to work, so fairly nostalgic for me. The Flint Tower was used for the recruitment, deployment and training of soldiers during the First World War. 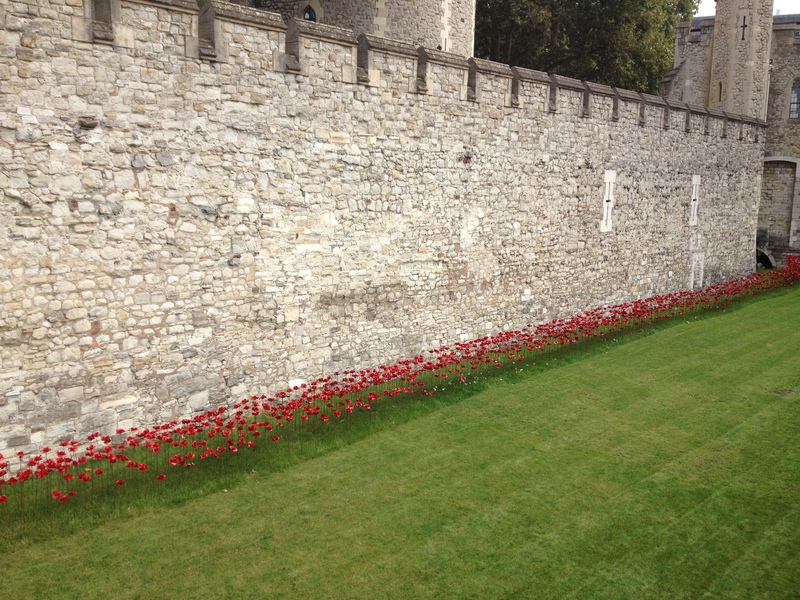 Around the perimeter of the Tower there is a beautiful border of poppies. And then this stunning cascade of poppies a bit further on. 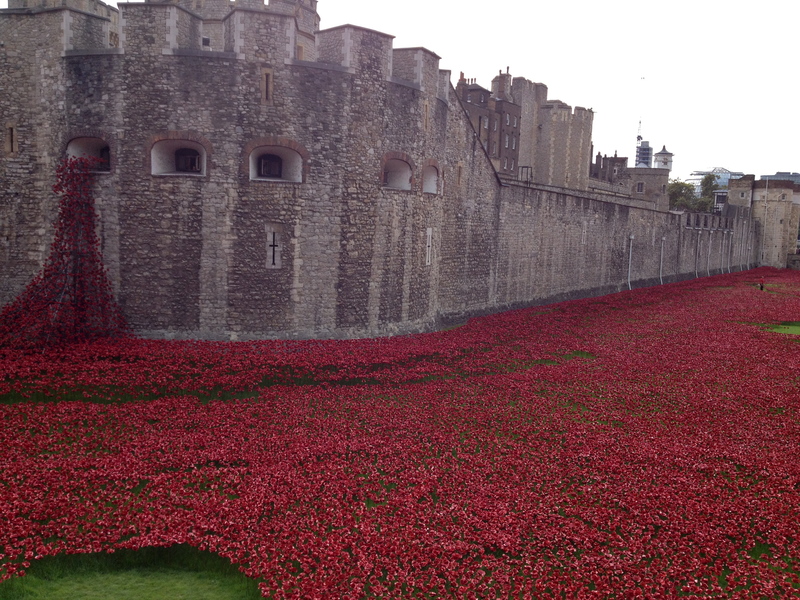 But within the moat itself, well, that’s where this display is truly breathtaking.. it literally is a sea of red. This installation ends on November 11th, 2014, so make sure you go before then if you wish to see this magnificent sight for yourself.